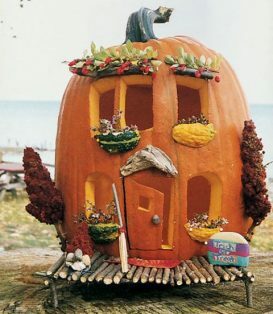 I am totally amazed by these pumpkin carving ideas! Halloween is right around the corner and that means you get to carve a pumpkin. Such a great time to get creative and have a little fun. 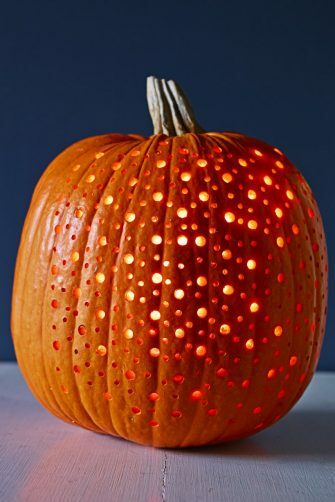 So here you go..cool pumpkin carving ideas! 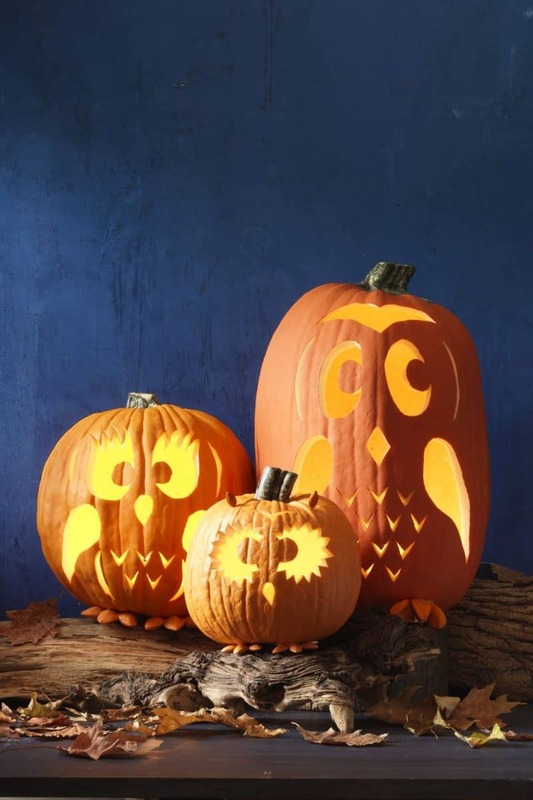 Here are some great pumpkin carving ideas. Carving pumpkins is a great way to thrill trick or treaters. 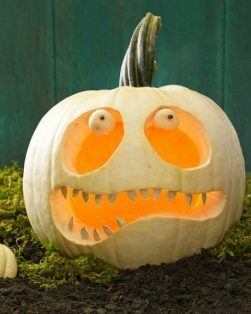 Whether you want to carve a classic jack or like to use a pumpkin carving pattern there are lots of ideas here. 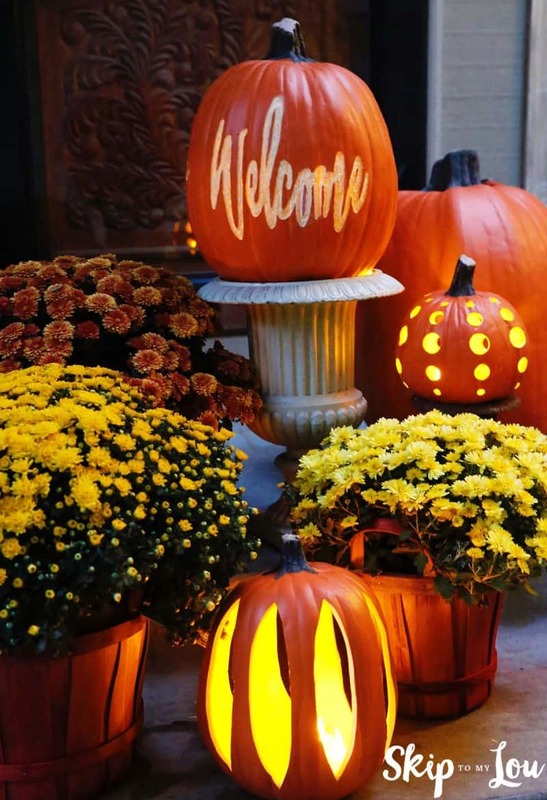 Also, pumpkins can make great Halloween decor on your front porch. 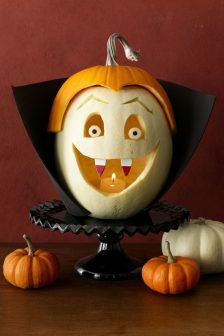 So let’s make an amazing Jack O Lantern with a cool pumpkin design. Get kids involved it’s just so much fun. A cheesy grin is pretty fun but why not have the best house in the neighborhood with these amazing ideas. 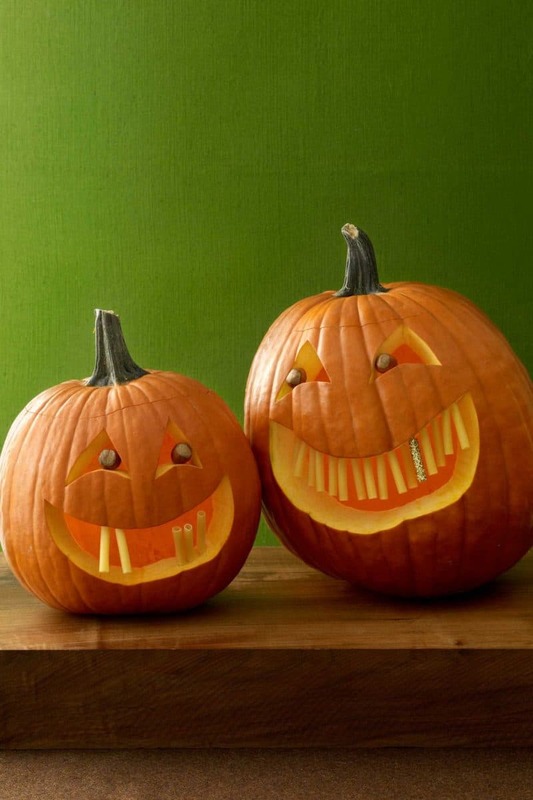 These adorable toothy pumpkins can be yours! Simply follow the step by step and you will have a very cheery front porch! 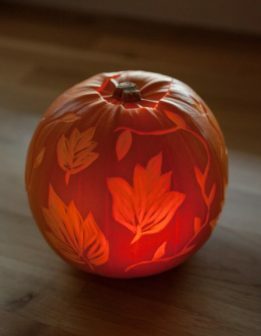 Etched Leaves Pumpkin Carving Idea. Why spend time carving out a pumpkin’s seeds and guts when you can etch beautiful designs into the side like this fall-inspired pumpkin. Friendly Vampire. No bloodthirsty monsters here. Yes, he’s got a set of fangs, but what’s not to love about this adorable Dracula face? We love us some pumpkin carving at our house. This year I wanted a way to really liven up our carved pumpkins. I thought big DIY lighted eyes would do the trick! Zombie Skeletons. The walking dead are rising up — in your lawn. Life-sized bony limbs fit stretched across doubledecker gourds. Spots and Dots. It may look elaborate, but this polka-dot pattern is fairly easy. Faux Bois Pumpkin. 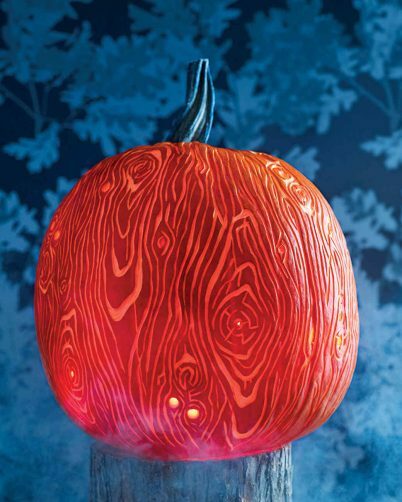 Looping wood grain onto your pumpkin is a cool, unexpected twist. 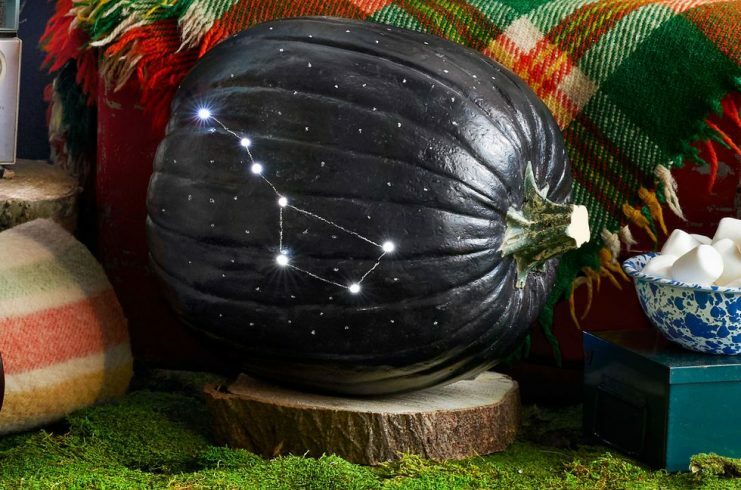 Big Dipper Pumpkin. A twinkling twist on typical carved decor. Owl City. This family of birds is a literal hoot. 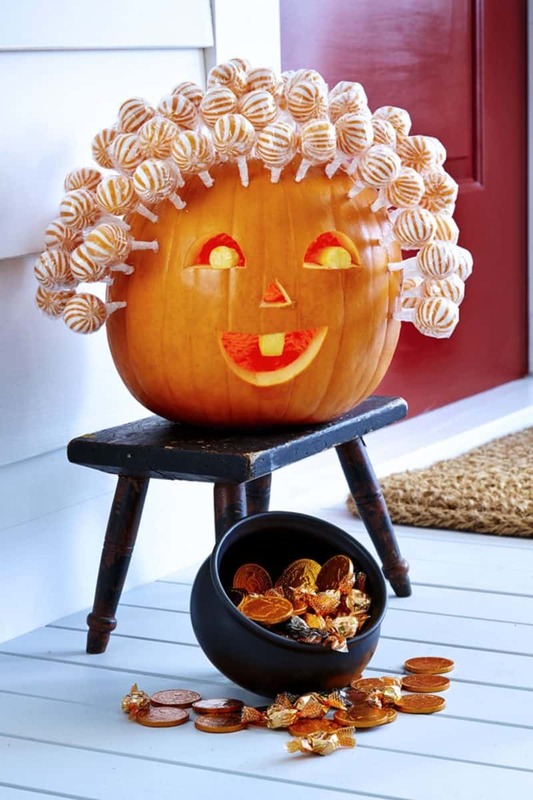 Carve out their cute expressions using free templates, and then attach painted nuts for tiny ears and feet. 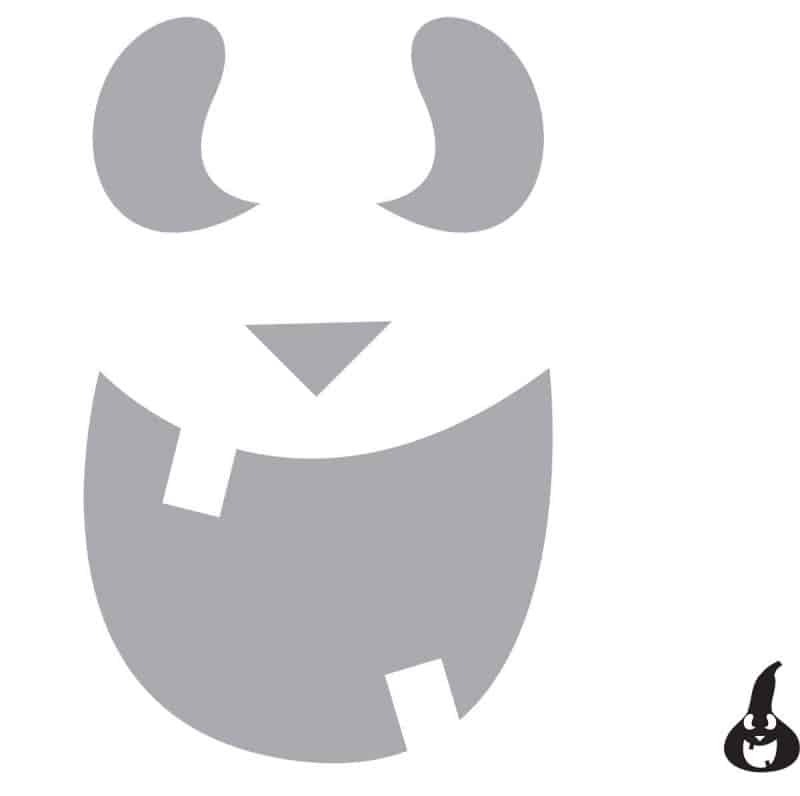 Check out this unusually Spooky Face. Using white pumpkins is the super easy way to up your jack-o-lantern game. These sunflower pumpkins are unbelievable. Sunflower season might be over but that doesn’t mean you can’t have these beauties blooming on your front porch during the fall months. Adorable Lollipop Pumpkin. Enjoy this pumpkin in the weeks following Halloween by indulging in these sweet lollipops (suckers). I just love this one. 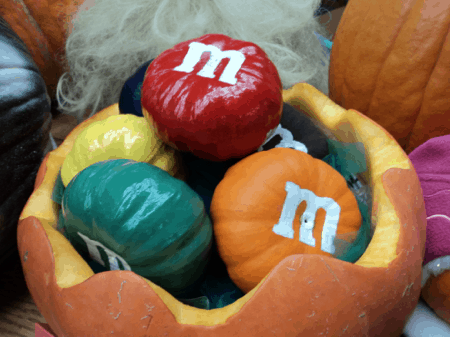 Think outside of the box with these unusual ways to use a large pumpkin! Plaid Vase Pumpkin Carving Idea. 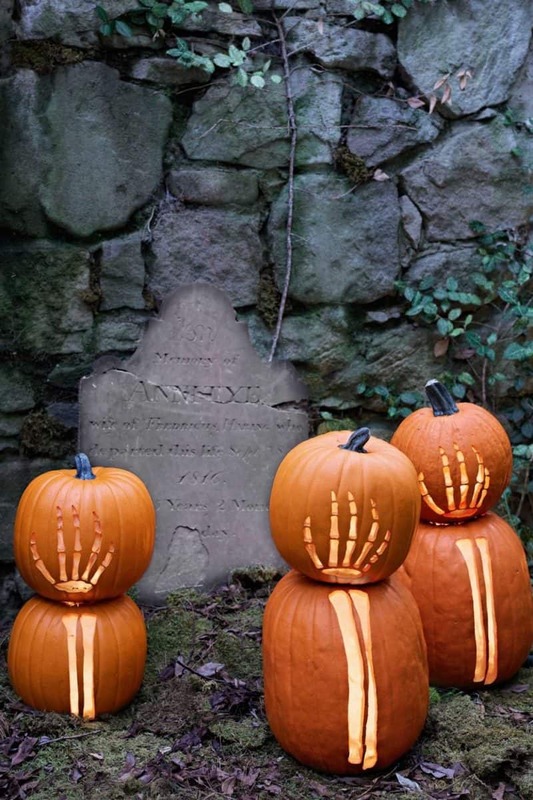 Who said you had to use pumpkins just to carve Jack-o-Lanterns? 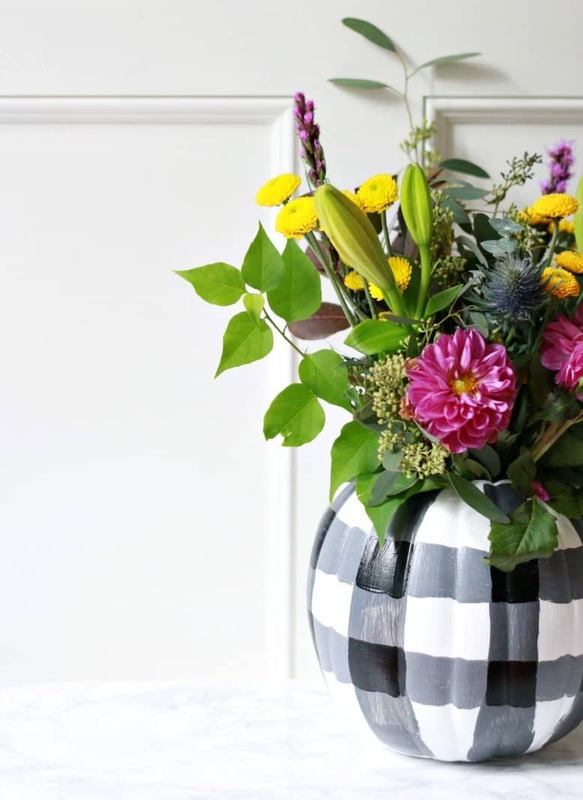 This year add a festive fall touch to your home with this cutely painted pumpkin vase. 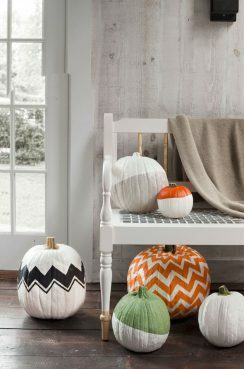 Patterned pumpkins. You can create all of these nifty designs using acrylic paint and painter’s tape in any color you want. Succulent Arrangement. This gorgeous gourd works as a front door decoration and table centerpiece. 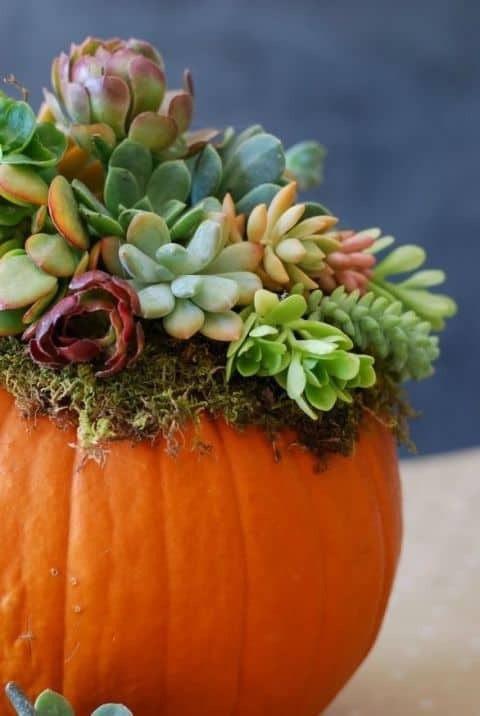 Such a great way to decorate with succulents this fall. Pumpkin Punch Bowl. 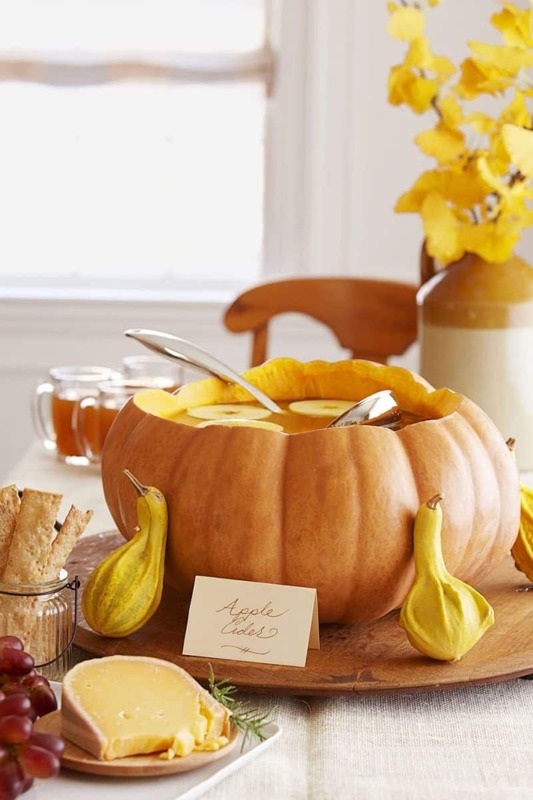 Impress your Halloween party guests by serving up apple cider inside a carved-out pumpkin. This is so amazing! 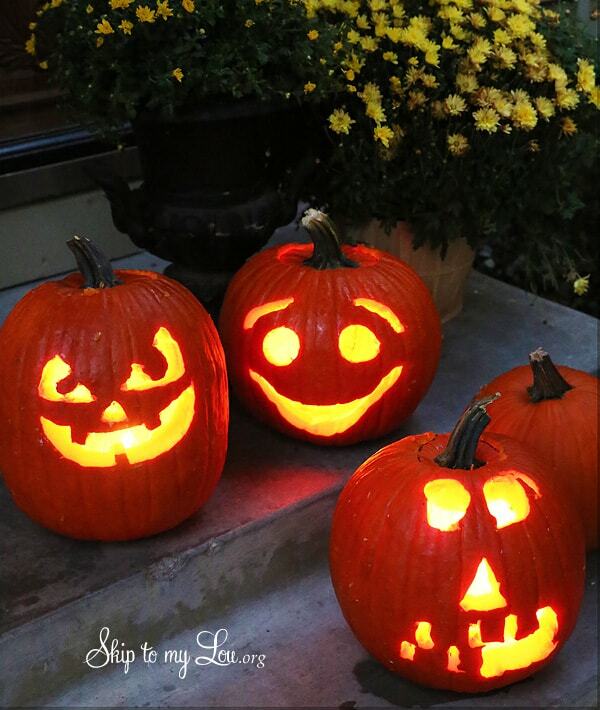 These pumpkin votives are a fun way to decorate for Halloween. 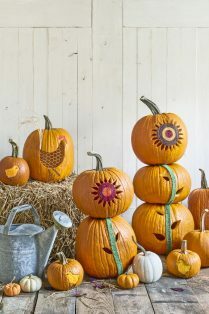 Line them on some steps or around the pumpkins on your porch. You might also like these pumpkin carving tricks. 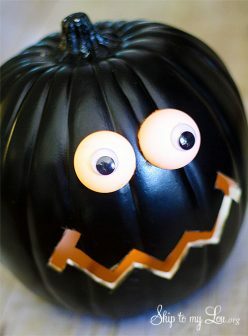 From how to gut a pumpkin to how to carve, these easy pumpkin carving ideas will help you create some amazing pumpkins. We use a simple (and fun) trick to remove the insides of the pumpkin. There are even free templates! 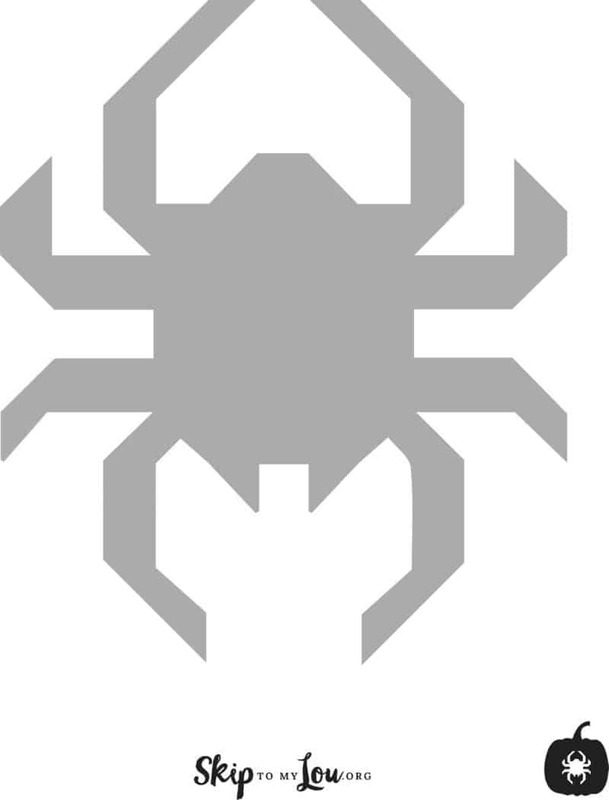 Make pumpkin carving easy for kids with these free pumpkin carving stencils. Loads of designs to choose from.